A well-maintained apple tree can provide many years of fruit and beauty in its location. Though the tree requires regular maintenance and attention, apples trees are relatively easy to care for. Train your apple tree while it is young. Create a strong framework for your apple tree by training the central leader. Prune the scaffold branches by trimming them back to complement the shape of the tree. Failure to train your tree can cause branch breakage and early dropping due to the excessive weight which is caused by the growing apples. Prune your tree annually. Thin your tree after the natural fruit drop to promote vigorous growth and reduce the potential for disease and insect infestation. 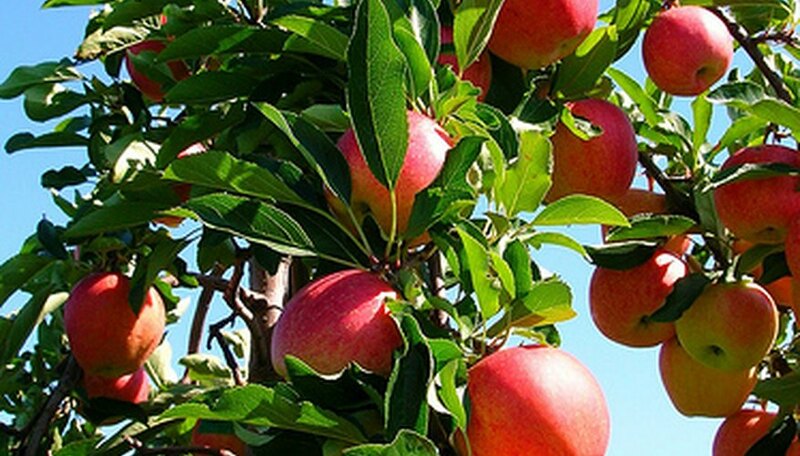 Fertilize your apple tree with nitrogen fertilizers. Newly planted and young apple trees should be fertilized approximately three times per year. Fertilize newly planted trees one month after planting with one cup of nitrogen fertilizer. Fertilize it again in May and June. The following year, fertilize the tree in early spring. Then, repeat the process again in April, May and June. Each application following the first year should include two cups of nitrogen fertilizer, such as a 21-0-0. Apply the fertilizer around the base of the tree and at least six inches away from the trunk of the tree. Fertilize mature trees (4 years old or older) at the appearance of bud break and again in May or June. Nitrogen applications should be 1 lb. per inch of trunk diameter. Water your apple tree at least two times per week during dry periods. This is especially important for young trees. When watering your tree, water long enough for the moisture to reach the roots of the tree. This is generally several inches deep. The roots, however, cannot tolerate excessive water or pools of water. Ensure that the soil and surrounding tree area is properly irrigated to avoid damages and possibly killing the roots. Mulch can be used to maintain the surrounding soil’s moisture. If you choose to mulch your tree, place 4 to 6 inches of mulch around its diameter, and make sure that the mulch is several inches away from the trunk. This will ensure that pests and animals do not attack the trunk of the tree. Protect your tree from weeds and grass to avoid growing competition. It is common for weeds and grass to grow around an apple tree. However, this growth can steal moisture and nutrients from the apple tree. Keep weed and grass growth at least three feet away from the tree’s trunk. Herbicides can be used but may damage or kill the apple tree. Using mulch around the tree is ideal as it will not harm the tree. Harvest your apple tree when the apples are full grown. Most apple trees begin to produce fruit at their third or fourth year. Every apple tree reaches maturity at different times. The harvesting time is dependent upon the variations of the climate and growing patterns. Observe your tree and fruit as it grows. As the apples reach their full color (based on your tree selection), inspect the fruit for firmness and shape. Use a taste test to see if the apples are ready for harvest. If the apple you tasted is ready, all apples of the same size or bigger will also be ready for harvest.